Mission: Founded in 1900 by the financier Spencer Trask and his wife Katrina, herself a poet, Yaddo is an artists’ community located on a 400-acre estate in Saratoga Springs, New York. Its mission is to nurture the creative process by providing an opportunity for artists to work without interruption in a supportive environment. Cost: There is no fee for residency. Yaddo’s nonrefundable application fee is $30, to which is added a fee for media uploads ranging from $5 to $10, depending on the discipline. Application fees must be paid by credit card. Accommodations: Each artist has a private bedroom in one of several buildings on the estate. Linens are provided, and laundry facilities are available. As for meals, breakfast and dinner are taken communally, while lunch is packed for each artist to carry away. Although the kitchen cannot offer meals for special diets, vegetarian alternatives are provided. Other than the specialized equipment provided in the photo, printmaking and welding studios, Yaddo does not provide supplies or equipment for professional work, such as stationery, printers, paper, typewriters, paint, power tools, or personal computers. Several computers, along with wireless internet, are provided for guest use in a central location. Internet service, by design, does not extend to individual studios and bedrooms. Saratoga Springs has an art supply store, and Yaddo office staff members can refer artists to computer rental agencies. Each guest is assigned a private studio. For visual artists, there are studios for painting and drawing, printmaking, sculpture and welding, as well as a black and white darkroom. Because the studios vary in size, it is important that visual artists make clear the dimensions of the work they propose to do. There is no equipment for editing film or video. Composers’ studios are equipped with pianos. Choreographers may request portable mirrors, barres, and marley. Some of the larger bedrooms serve as both living and working space for writers. Appropriate table space is supplied for writers using computers. Length of Stay: Residencies vary in length – the average stay is five weeks. The minimum stay is two weeks; the maximum is eight weeks. Demographic: Artists who qualify for Yaddo residencies are working at the professional level in their fields. An abiding principal at Yaddo is that applications for residency are judged on the quality of the artist’s work and professional promise. 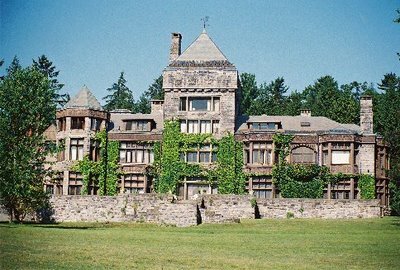 Yaddo accepts approximately 200 artists each year. Yaddo has a strong tradition of internationalism, and welcomes artists working in all disciplines from around the world. Writers who work in languages other than English are welcome to apply if they can supply samples of work in translation as well as in the original. A working knowledge of English is helpful for international artists. Yaddo does not provide an interpreter for artists who speak little or no English. Benefits: There are winding roads and paths through the woods. There is a tennis court, a swimming pool, a pool table, a ping-pong table and a supply of bicycles to be shared by guests. Yaddo maintains several small libraries, including one of books by Yaddo authors. Yaddo provides transportation to and from downtown Saratoga Springs late each weekday afternoon. Off the grounds, Saratoga Springs offers many amenities. Guests may borrow books from the excellent public library and the library at nearby Skidmore College. For a fee, they may use the athletic facilities at the YMCA or a local private gym. Deadline: January 1, for residencies starting May 1 of the same year, through February of the following year. August 1, for residencies starting late October of the same year through May of the following year. Posted in New York, Yaddo ResidencyTagged American, Art, art library, art residency, Artist, Artist Residency, arts, Dance, Drawing, Fall Residency, Fellowship, Film, Installation, International, Literature, New York, Painting, Photography, Printmaking, Rate My Artist Residency, Sculpture, Spring Residency, Stipend, Studio, Summer residency, Theatre, United States, video art, Winter Residency, workspace, Writers, Yaddo, Yaddo ResidencyBookmark the permalink.